Every so often a trip to the thrift store is more rewarding than you ever expected. I recently went to the Wayside Christian Mission thrift store here in Louisville and ran across a book by the famous 20th century Baptist preacher, T. T. Shields (1873-1955). 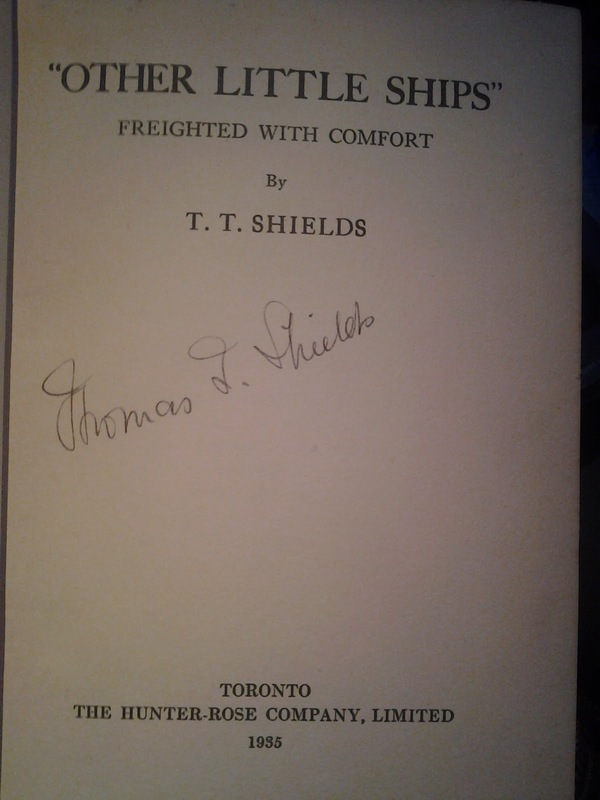 T. T. Shields was the pastor of the Jarvis Street Baptist Church in Toronto, Ontario for 45 years. Shields is known for his defence of orthodox Christianity in Canada, and he was also the founder of the Toronto Baptist Seminary. As you can see from the photo above, I ran across a signed copy of Shield's book "Other Little Ships," published in 1935. I sent this photo to Dr. Michael Haykin at Southern Seminary, and he confirmed that the signature was genuine. By the way, I paid $. 15 for the book!